Not quite a cookie, and almost a cracker, hard tack is a traditional flat bread of the Scandanavian kitchen. My grandmother served hers with butter and orange marmalade, which I always enjoyed. These semi-crisp crackers also taste delicious with any good jam (including raspberry rhubarb I can attest), chutney, or cranberry salsa. I enjoy rolling the dough out with my children, since they can cut out shapes with cookie cutters if they wish. 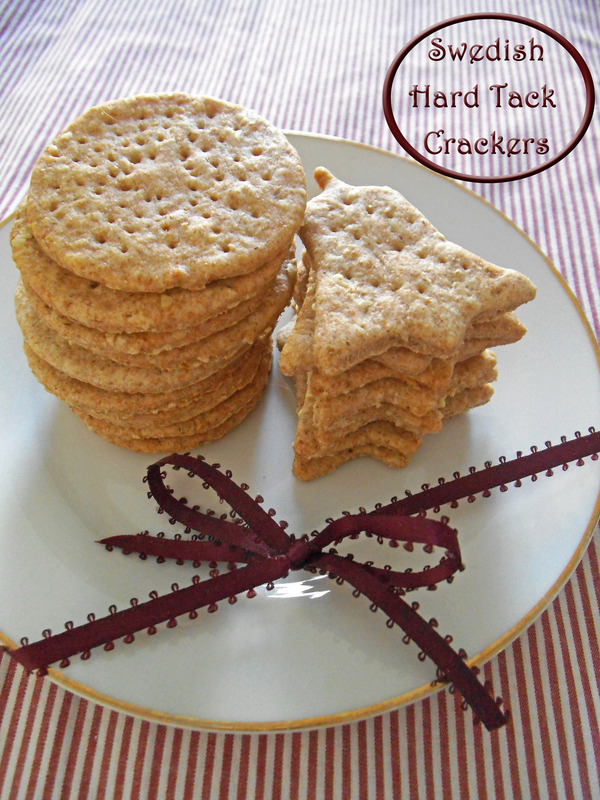 Also, hard tack is low in sugar and easy to pack. We enjoy snacking on these all day long! 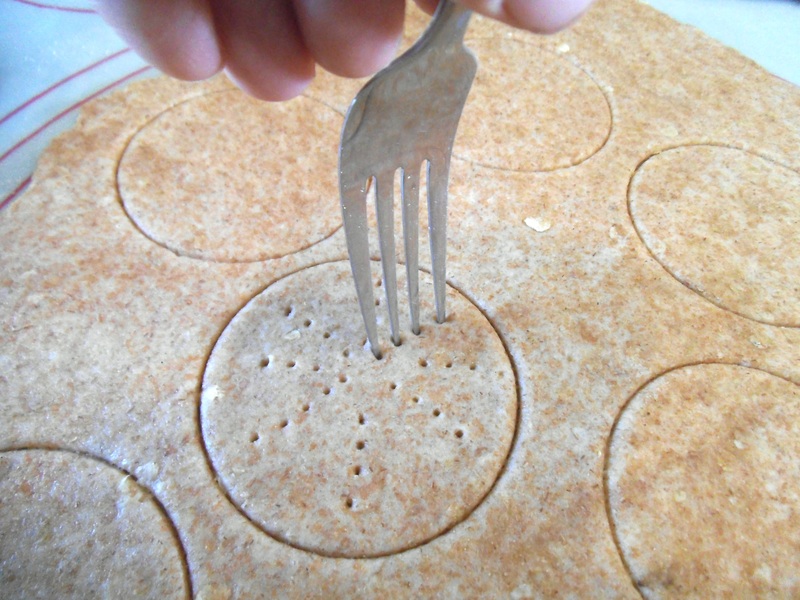 Some Swedish cooks, like my mother, have a dedicated rolling pin that presses a unique waffle pattern into the flat dough. In my kitchen we simply use a fork. Either way, this recipe is authentic, passed down from my grandma to my mom to me. I have lightly adapted it to include spelt flour and light brown sugar, with great results. If you are looking for a healthy homemade alternative to store-bought cookies and crackers, this simple recipe is just right. Sift together dries and mix in shortening, as for pie crust [I used two butter knives]. Then add cream and milk enough to make it soft, not sticky. Use a rolling pin to roll dough as thin as possible [on a lightly floured surface], then prick with a fork. Cut in pieces and bake on a cookie sheet [or baking stone, at 400 degrees F (200 C) for about 10 minutes, until tops are golden but not too dark]. I like to share my recipes at Allergy Free Wednesdays and more. You can make hard tack at home? (Go ahead, you can call it knackebrod. 🙂 ) Cool! May I reblog this post today for my “Tuesday Reblog”? I totally did not know you could make this stuff at home. Or that anyone I know could, at least. I’m a quarter Swedish and Now Church is probably more Swedish than that, but I’ve never seen anyone serve this stuff during the coffee hour there. That may well be, of course, that store-bought Swedish hard tack (knackebrod) kind of tastes like . . . sandpaper? I don’t know. I’ve never eaten sandpaper. Here’s the thing, though. I don’t know if you have to be Swedish to like knackebrod the way you have to be English (or crazy) to like Marmite, but I love knackebrod. And this stuff looks way more delicious than that stuff in the supermarket. So I’m pretty stoked that Mrs. Swirls and Spice posted this recipe today. So stoked that I’m sharing it with you. These “crackers” look delicious!! Thank you for linking up to Saturday Dishes! Hope to see you again next week.